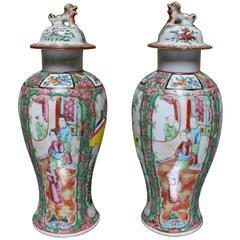 Exceptional large Kutani lidded porcelain jar/mizusashi, hand painted on the finest quality porcelain in red, green and purple with generous gold details, the signed work of highly acclaimed master porcelain artist of the Kutani region of Japan. This artist’s works have been selected time and again by the Imperial Household to be used as gifts for foreign dignitaries visiting Japan. This artist's work is displayed together with the works of other Kutani master porcelain artists and “living national treasures” in the concourse of the Kanazawa Station – recognized as “one of the six most beautiful railway stations in the world.” Inspired by traditional Kutani designs, the artist's distinctive style combines gracefully understated flora and birds with detailed geometric patterns. These elements comprise his signature style that has earned the admiration and appreciation of fans throughout the world. This exquisite porcelain piece, called "mizusashi," a lidded container for cold water used during tea ceremonies, showcases an intricate and extremely detailed geometric pattern in red, yellow and purple with hints of gold, the artist’s signature virtuoso design. The two panels present a delightful snapshot of floral beauty against a pure white background to convey the crisp and heavily scented air of early autumn (chrysanthemum) and late winter (plum blossoms). The panels are surrounded by an intricate geometric pattern that converges to form a dizzying field of intertwining shapes and colors as it approaches the center of the removable lid. This large piece comes in a custom made wooden case signed by the artist. 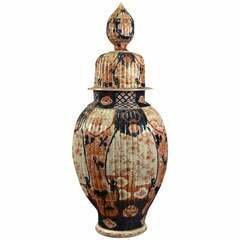 Dimensions: H 6.5 in, D 8.5 in Kutani porcelain kilns with 360 years of history are noted as Japan’s finest, continuing to introduce amazing shapes and exquisitely hand painted vases and chargers. 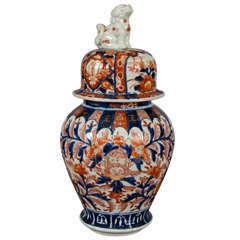 Large Chinese blue and white jar with lid with a foo dog finial. 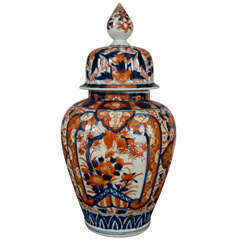 A large Imari Japanese vase — gold leaf, manganese, and cobalt — with cover and large finial, featuring lattice work, ruyi heads and the Three Friends of Winter.